In 2007 my Sr. Pastor, Roland Boyce, came to me and said he was writing a book that he wished he had while raising his kids. He told me stories of tough questions his kids asked during their teenage years and how he wished he had a resource to both quickly reference and help prepare him for what was coming. Even though the Bible doesn’t deal with these issues directly, it does delve in the lives of real people who dealt with many of these issues. Noah got drunk, Elijah struggled with depression and suicidal thoughts, and David faced issues of adultery and murder. In the absence of such a resource, he decided to write one himself. 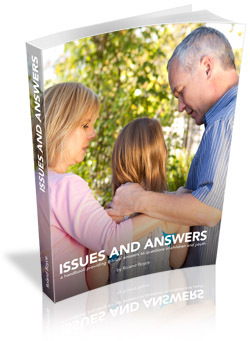 His book, “Issues and Answers: A Handbook Providing Biblical Answers to Questions of Children and Youth,” is now complete and he’s giving it away completely free! At 300 pages long, it’s definitely more in-depth than your average ebook. This could work great as a resource to distribute to the parents in your church or even to use as curriculum for your youth group.